TK Angus originated in 1984 when Tim and Kim Marlatt were married, and today also includes our son, Rick and his wife, Jenn, and our daughter, Sara. The basis of the TK Angus herd goes back to heifers that Tim showed in the 1970s, including 5 Grand and Reserve Grand Champion females at the Nebraska State Fair. The Tesa and Edella cow families go back to these original foundation females. In 1989 we held our first annual bull sale at the Ogallala Livestock Auction while living in Imperial, NE. In 1991, we moved to Gordon and made TK Angus a full time operation. The move to our current location in Wood Lake, NE was made during the spring of 2013. We continue to market our bulls through an annual bull sale, held on the first Monday in December. In 1994 we held our first female sale, and we continue to offer females through a production sale on an every other year basis. This year we will be adding a spring bull and female sale to our offering. 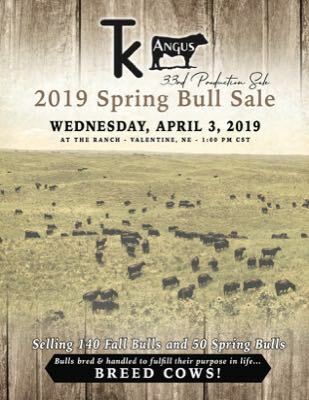 At TK Angus, our philosophy has always been to find a good herd sire prospect that fits into a consistent phenotype, hang our hat on him, and put him to use. We feel that this philosophy has led to a uniform, productive cow herd and also provides our customers the opportunity to select from large sire groups at our annual sale. On the "Sires" page of the website you can find both our current sires as well as some of the foundational bulls that have walked the pastures at TK Angus and continue to have a lasting impact on our cow herd. We would invite you to browse through this listing as it gives a good insight into our breeding philosophy. Our goal is to produce bulls that make our commercial bull customers profitable in the long term. And as Angus females are fertile, we offer proven females to other breeders in production sales and private treaty in order to match our grass resources. We live, work, and enjoy the cattle business and invite you to the Sandhills of Nebraska for a tour of our operation! !